Have you ever noticed on those windy, snowy winter days on the highway, when you're keeping your speed down and driving with extra caution, that's when a Billy Bigrigger will blow by your truck at the speed limit or over, leaving a rooster tail of the white stuff in his wake? And, have you noticed how often you see the same truck again a few miles down the road laying on its side in the median or in a ditch off to the right? 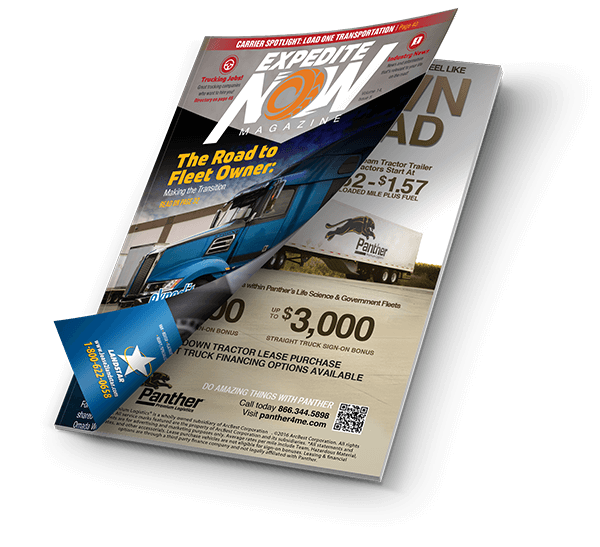 According to the Journal of Transportation and Statistics, there are about 20% more truck crashes during the winter than summer in the central United States. The number climbs to 60% in the northern third of the country. All of the professional driver’s skills come into play when the thermometer dips below the freezing mark and slippery road surfaces and reduced visibility make driving a challenge. Staying safe on icy roads requires close attention to your driving, anticipation of unsafe situations and preparing your equipment to weather the cold. Whether or not to run requires a judgment call. If the highway is closed, the decision has been made for you, but veteran drivers will tell you if you don’t feel safe about the weather and road conditions, go with your gut instinct and park it. Think about your load in relation to the weather and road conditions. Is it light or heavy? This factor will determine how you will drive. If you are empty or hauling a light load, your stopping distance will be greatly increased, and your stability will be greatly decreased. There are even more items to check off the list when doing your pre-trip walk around and that includes taking the time to clear all windows of snow, ice or fog before starting out. Also, clear any snow off the hood – it comes loose when driving. Your windshield washer solution should be a winterized blend that won’t freeze up on the glass. Carry an extra jug of it. New wiper blades and proper arm spring pressure help keep the windshield clear. Stop frequently to clear snow and ice from the side windows, mirrors and lights. Being seen in a storm is just as important as seeing. Even though you can see, drive with low-beam headlights in snow, fog or just winter haze. Keep all lenses free of dirt by wiping them periodically. Dirty headlights can cut visibility by 50 percent or more. Don’t forget the directional lights, taillights and marker lights. Give yourself plenty of extra time for getting to your destination. Speed limits are for perfect, dry conditions. On winter’s icy roadways, half the speed limit may be suicide. Plan to drive slower and increase your following distance behind other vehicles. Take curves and hit the crest of hills at a slower pace, too. Be prepared to steer around any problems that may be hidden from view. Gear down carefully to slow the truck, but avoid using the engine brake on icy roads because the abrupt slowing of the drive wheels can cause a skid. 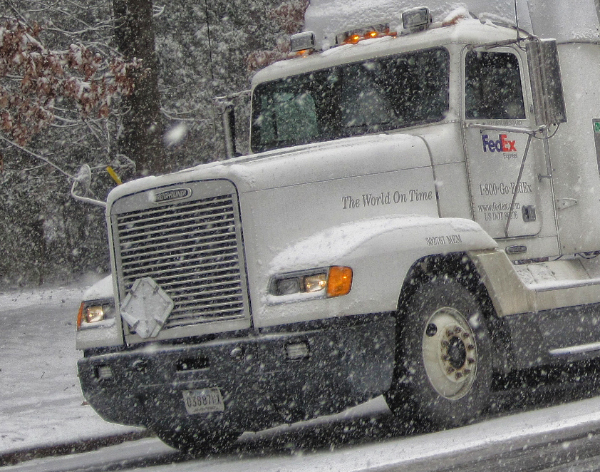 The ability to stop your truck is one of the biggest challenges of winter driving. Check the brakes before pulling out onto a roadway to make sure they aren’t frozen. Intersections and curves are generally more slippery and require slowing the vehicle well ahead of time to come to a stop. Gentle braking is always the order of the day. If at all possible, avoid hard braking or abrupt maneuvers that can cause a skid. Starting out, avoid spinning the drive wheels. That creates heat and makes the surface even more slippery, just as icy roads become more slippery as the air temperature rises. Remember that shaded roadways might still be icy when other sections of the pavement are dry. Be sure your tires have adequate tread for traction in snow and to reduce the risk of hydroplaning in rain or puddles on the road. You may hear that reducing tire pressure is another way of increasing traction. Reducing air pressure will not give you more traction and your tires could become seriously under inflated, affecting steering. Keep in mind that every time the outside temperature drops 10 degrees, the tire air pressure goes down about one pound per square inch. Remember too that under inflated tires is the major cause of tire failure. At 30 degrees ice is twice as slippery as it is at 0 degrees. It also forms first and lasts longer on bridges and in the shade. If you hit an unexpected patch, don’t try to brake, accelerate or downshift. Let up on the pedal and let the vehicle coast through the slippery area. Maintain at least three times the normal following distance on snow or ice. If you are being followed too closely, maintain an extra distance behind the vehicle ahead so that you can slow down or brake gradually. g can be done smoothly. One aspect of winter driving that doesn’t get enough attention is ice and snow on the trailer and cargo box roof. It is extremely difficult to deal with this problem, but denying its existence can lead to overweight at the scales and accidents caused by flying chunks of ice. Only your judgment can tell you whether to risk injury by finding a ladder or risk a ticket on the highway. But if snow and ice falling from a truck causes an incident, the driver will most likely be charged, says one law enforcement official. Stay in line when traveling to or from a snow zone. Don’t blaze your own trail, especially going downhill – you’ll only manage to create a worse situation. You’ll even clog the only open space emergency snow vehicles can travel. Bad weather can cause deer to be on the move. Be particularly alert when traveling in known areas of deer migration. When you see deer or other animals ahead, slow down and be prepared to stop until you are safely past them. A good defensive driving technique is to try to avoid animals if possible, however, do not swerve into the on-coming lane and risk a head-on collision, or run off the road and risk hitting another object. Watch out for these vehicles as you round corners, curbs, etc. They do not travel at a high speed; therefore, you’ll tend to come up on them quickly. Slow down. Plows and sanders will pull over periodically to let traffic pass. It’s risky to pass on the left of a snowplow because of blowing snow. After being in a warm vehicle, the soles of shoes or boots are warm enough to melt snow or ice, creating a film of water between the sole and the snow or ice surface. Be especially cautious for the first five minutes after leaving the vehicle. When walking on snow or ice, use short steps and keep your hands out of your pockets. These factors will help you maintain your balance. In hazardous weather, the effects of fatigue are more quickly felt. Be aware of your personal limitations and how they are stretched by the stress of winter driving. Stay warm, stay dry and stay safe.